As you know I'm in the process of giving CPR to my blog that is in need of some new life . I've teamed up with a fabulous chef wife who will be helping me keep it fresh and fabulous here. 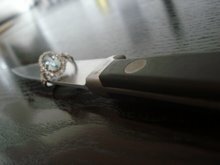 Before you read some great posts by my co-host, here is her introduction. Like I did in the infancy of this blog- she'll remain anonymous- you know how those chefs can be about their name being out there. 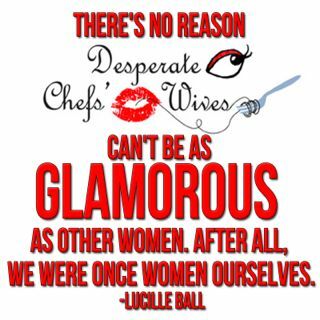 I have been an avid reader of Desperate Chef Wives for some time now. I discovered Hilary and her blog shortly after she began writing. At the time, I had just moved across country with my husband in order for him to begin his professional career as a chef. Needless to say there were moments of loneliness. However, when I began to read Hilary's posts, that feeling dissipated. Two years later and another move back across the country, I have learned an exceptional amount about the industry - for all it's faults and wonder. Now, Hilary is gracious enough to give me the opportunity to provide comfort, humor and fortitude in the same manner she provided me. Designer. City Dweller. Cocktail lover. Useless furniture collector. Lousy dinner cook. Wanna-be baker. Makeup obsessed. Beer advocator. Morning hater. High heel accumulator. Flea market shopper. Workout dodger. Roof top gardener. Wisecracker. Poor spelling skilled. Food captivated. 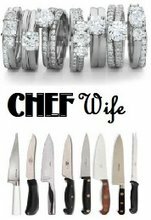 Chef wife. Welcome, new DCW! I look forward to reading some of your posts. Hey, BB- I'm so excited for our new friend, too! You're going to love her! How are you these hot summer days?